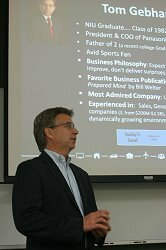 Tom Gebhardt returned to Northern Illinois University as part of the College of Business’ Executive in Residence Program, speaking to Ursula Sullivan’s Marketing Strategy 495 class Sept. 26. Gebhardt, a 1982 marketing alumnus, is now the president of Georgia-based Panasonic Automotive Systems Company of America, which provides systems and components to the North American automotive industry for creation of integrated vehicle solutions including premium audio systems and connected car concepts. He previously served concurrently as president of Panasonic Factory Solutions Company of America in Rolling meadows and Panasonic Industrial Company. His overarching lesson to students focused on the changing dynamics in the market place. Where steadiness and stability were valued when he graduated, today’s organizations now look for flexibility, change and growth — especially in the digital and global area. Students graduating today are better positioned for this environment, having a solid understanding of connectivity in the digital age. It’s this appreciation that fuels marketing and sales, which has become the most important component of today’s companies. Gebhardt feels it’s all about relating to customers and clients. The successful student knows that and is flexible enough to shift and change, when needed. Each semester, high profile executives, such as Ralph de la Vega, President & CEO AT&T Mobility and an NIU MBA alumnus, serve as Executives in Residence in the NIU College of Business. These executives possess a wealth of business and world experiences, are highly respected within industry, and come from the ranks of CEOs, company founders/owners, or senior level executives. These highly accomplished individuals share with NIU business students their vast expertise on addressing global business issues, leading organizations, developing relationships, giving back, and succeeding in life. Under dean Denise Schoenbachler’s direction, the program has been in existence for approximately six years and is coordinated by the college’s development director, Anthony D’Andrea, and alumni director, Cass Young. On average, more than 100 business professionals and visiting academicians a year share their expertise and perspectives with NIU business students through regular speaker series or other special events.